Do you still have those chickpeas left over from yesterday’s vegan crab cakes recipe? Pull them out of the fridge, y’all. Let’s make some ranch roasted chickpeas! 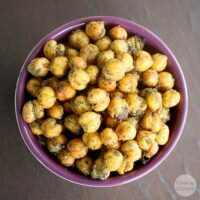 Roasted chickpeas are an addictive, healthy snack, and I’m pretty sure that coating them in ranch makes them even more delicious. I mean, is there any recipe that a little bit of ranch goodness doesn’t improve? Probably not, right? The secret to these ranch roasted chickpeas is my Homemade Ranch Seasoning. It’s a three-ingredient spice mix that’s great on tofu, in salad dressings, and – it turns out – on oven-roasted chickpeas. 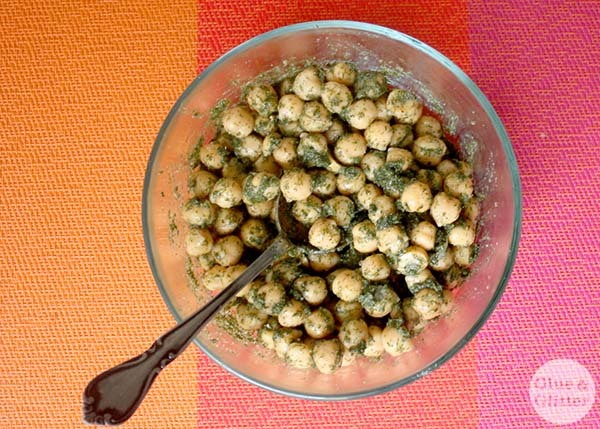 If you’ve never made roasted chickpeas before, prepare to be amazed at their simplicity. Toss the chickpeas in the seasoning and a little bit of olive oil, spread them out on a cookie sheet, and stick them in the oven. The hardest part is waiting for them to get that good, golden-brown color and crunchy texture. And waiting for them to cool is hard. Hurry up, chickpeas! You can eat these as a snack, use them as a topping for a summery salad or grain bowl, or stuff them in a sandwich. 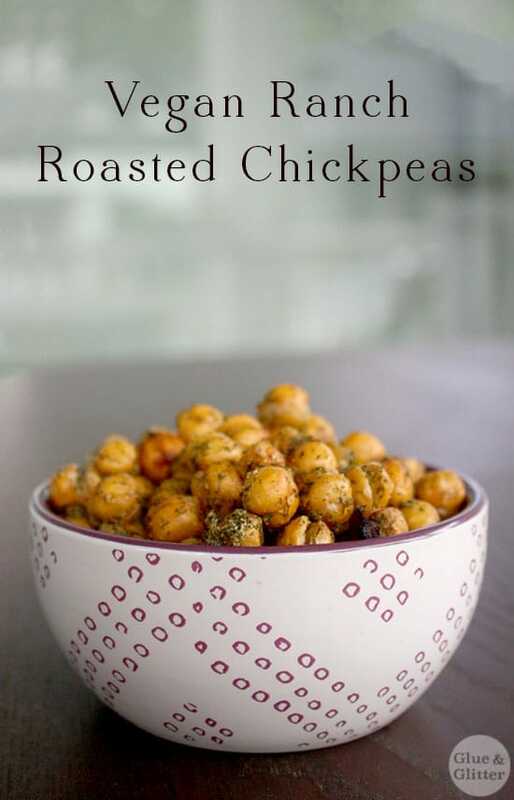 I bet there are other ways that you can use your roasted chickpeas, too. Tell me about them! Vegan Ranch Roasted Chickpeas are an addictive, healthy snack, and I’m pretty sure that coating them in ranch makes them even more delicious. I mean, is there any recipe that a little bit of ranch goodness doesn’t improve? Probably not, right? In a small bowl, toss together the beans, Ranch Seasoning, salt, oil, and lemon juice so the beans get nice and coated. Spread them out into a single layer on a cookie sheet. I lined mine with my Silpat, but since these have a good amount of oil on them, I don’t think it was really necessary. Bake for 30-45 minutes, stirring them after 20 minutes, until the chickpeas start to turn just a little bit golden brown. Let them cool until you can comfortably handle them before you munch! You can also store them in an airtight container in the fridge, and they will keep for a couple of days. Check on your chickpeas frequently during the last few minutes of cooking. You want them crunchy and golden brown, but not burnt. 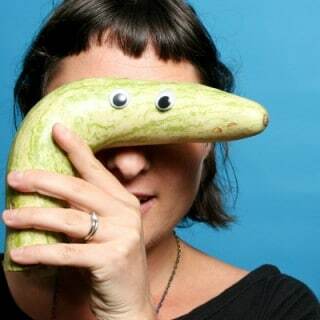 Mmmm!! Love this affordable, easy snack and good for you too? Perfect! Thanks for sharing with us at #TryaBiteTuesday – hope to see you next week!!! Thank you for hosting! I was delighted to discover your linkup. 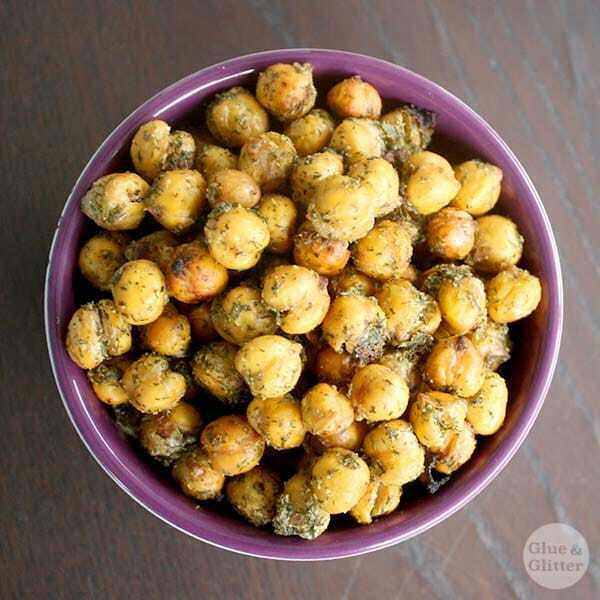 I love roasted chickpeas for a snack or salad topper. Yours look delicious, and your photos have been looking especially nice lately! Thank you so much, Cadry! I have been working on learning more about taking photos, and it means a lot that it shows a bit!